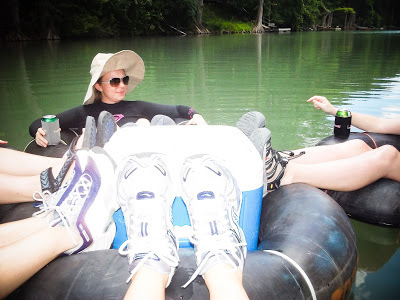 The weekend before we went to San Diego I took a solo trip with some of the Vegas girls to the Guadalupe River. 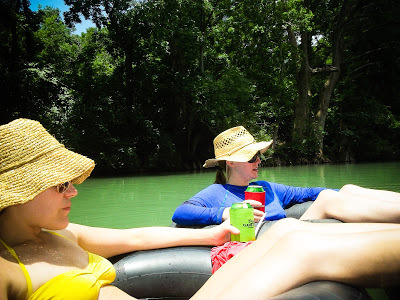 It was an awesome weekend filled with nothing but talking, toobing, eating and drinking wine and Bud Light Lime (drink it if you go to the river, you can thank me later). Alex was appalled by our lack of activity. I was so lazy I took zero photos. Luckily my friend Joanna (the front in red) was on it and packed a water proof camera for the toob. 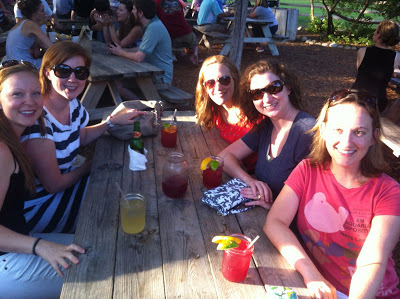 She gives an excellent rundown of the weekend on her blog, so I will spare you the full details. And she describes all of us perfectly. Of course I say that as she gave me a glowing recommendation, and you know I like people who think I am funny. Aren't we beauties? Three of the five of us were wearing long sleeve rash guards (get one immediately if you don't have one) and everyone had a terrible, wide brimmed river hat. Saturday morning everyone had heard from their husbands and/or spoken to their children, except me. I finally had to ask for a proof of life photo of my children who were in Alex's care for exactly 24 hours before the Walls took over. This is the photo I received. Really? A Spongebob tattoo for James? As it was fading off later in the week he would say, "Oh no, tatattoooo!" As they usually do, the Walls swooped in and took the boys out to their house for Saturday night. Liv has said that she knows I would prefer Alex have to take care of them all on his own, which is partially true. However, now I just can't fault them. Because a) I did the exact same thing when Alex was gone and b) I will do the exact same thing with my babies. The second McKayla or Sophie leave for the weekend I will be swooping in to save my grand babies from their fathers and spend time with them without their bothersome mothers. And look, they are already much happier than in the photo from their father. Well, James looks the same but don't pay attention to him.